We have what is called an autonomic nervous system that switches between a sympathetic fight or flight mode, and a parasympathetic rest and digest mode. Our sympathetic fight or flight is literally designed to help us run away from the predatory tiger in the African savannah. The problem with a relationship with a sociopath, with all its lies, losses, betrayals, possible cheating and endless drama, is that our fight or flight response gets turned on and doesn’t easily turn off. It brings with it a cascade of hormones where the danger signals tell your hypothalamus to trigger your pituitary to trigger your adrenals to release all kinds of stress hormones. These stress hormones can be used to your advantage to help mobilize you away from the sociopath. Once away and having implemented No Contact, it is very important to do all you can to restore the parasympathetic nervous system. Staying stuck in the hyper-adrenalized shocked state can be a set up for anxiety, panic disorder, depression, chronic fatigue, and many other major illnesses — including post-traumatic stress disorder, or PTSD. Years ago, I treated a woman who had been in ongoing high-conflict divorce and custody dispute proceedings with someone who fit the criteria for antisocial personality disorder. In the year following, she was diagnosed with both multiple sclerosis and cancer. As a clinician, this case was a wake-up call to me that our bodies are not meant for these ongoing toxic high-stress states. The longer time spent with a sociopath, the more there is a risk to potentially damage your health. What can you do to restore your health once you have gotten away from the sociopath? I recommend healing modalities such as yoga, acupuncture, psychotherapy with someone safe, exercise, meditation, proper nutrition, massage and safe social support. To start, I recommend a thorough medical workup to make sure you are at your best to take the healing trek to safe ground both internally and externally. And, if you’re wondering, what did I do after the e-mail I mentioned in the beginning of this article? I was at my clinic so I took my blood pressure. It was alarmingly high, with one of the numbers almost in the stroke risk region. I woke up and went No Contact. Thank you for your excellent article. Our society thinks that everyone must go to a therapist to deal with their abusive relationship only. From my own experience, the first thing that needs to be done when escaping a toxic relationship, is take care of your physical health, then once your health is in order you can seek counseling. I found counseling extremely stressful when I first left my ex sociopath husband, as I was already stressed out to my max during the entire toxic relationship. I felt, like I was going to have a heart attack revealing & reliving the trauma during counseling. So I stopped counseling and put my health back in order via an Endocrinologist doctor who was informed on the adrenal glands (he gave me adrenal gland vitamins & progesterone hormone Rx pills & I changed my diet). This made a huge difference in my mental clarity & after my body was moving in the healing direction, I was able to analyze & deal with the abuse I endured with a calmer mindset & more healthy physical body. I believe that, healing the adrenal glands are top priority when coming out of a toxic relationship, so is the Thyroid gland. As Hippocrates states: Let food be thy medicine. google the words in “ “ to find the videos & documentaries. 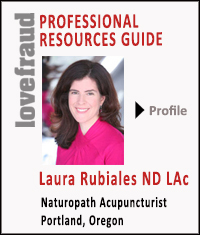 Dr. Laura Rubiales, please keep posting these great post here at Lovefraud. I should have gone to therapy, but there was none close by; and I had been in couples counseling with him, when the boys were younger. That just made things worse, he used issues that were brought up, as more ammunition against me. So, I have problems with counseling. My ‘fix’ was to take care of my body, by seeing doctor/dentist regular, eating better and daily exercise. I NEVER took care of myself like this, before. I use personal products I enjoy, clothes that I enjoy. These simple things help me.